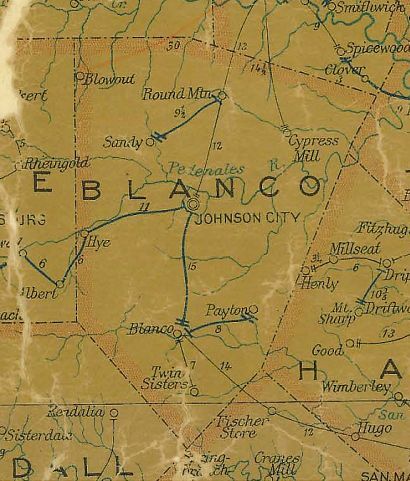 Unusual town names are proof that frontier Texans were not short on humor and imagination. A few of the more interesting place names are Gunsight (Stephens County), Lick Skillet (Fayette County), Topsey (Coryell County) and Ding Dong (Bell County). Blowout, 15 miles northwest of Johnson City in Blanco County, is a personal favorite. In 1854 about two dozen homesteaders from Kentucky settled near Comanche Creek about three miles below its source at Comanche Springs. The settlement had no name until the power of Mother Nature provided one. For this place "The Big Bang" was no theory. There was a cave not far from the settlement that was home to so many bats it took an hour for them to exit each evening. Millions of bats mean steaming piles of guano. Bat guano is high in nitrogen, phosphates, and potassium and is some of the finest natural fertilizer in the world. On the down side the smell has been compared to week-old road kill or really bad cooking. It is also flammable and can be highly explosive. One evening a thunderstorm passed through that part of the Hill Country and a bolt of lightning struck near the mouth of the cave. The guano exploded. The place has been called Blowout ever since. The only interruption in the mail service was on the rare occasions when heavy rains caused the creeks and rivers to flood and the time the Deputy U. S. Marshal arrested Pole Longly, Jr., the Burnet to Blowout mail carrier, for "abstracting money from the mails." In the early days settlers sold wagon loads of bat guano for fertilizer, but in time the guano business went to pot. People moved on to other towns. It looked like Blowout would dry up and blow away. Then in 1896 Frank Lacy, a local rancher, saw glittering particles in the creek and within days he had washed out a few panfulls of what was reported to be pure gold. When Lacy took his gold to town, the rush was on. Gold fever seized this part of the world. Prospectors hurried to Blowout, blinded by the glitter of gold. Soon between 20 and 30 miners worked around the clock. Four mining companies formed almost overnight. One company allegedly found veins of gold in a quartz ledge. One miner came to town with a nugget weighing 200 grains - about 7 ounces - not big as nuggets go but big enough to get people all worked up. The Blowout gold strike seemed too good to be true, and it was. The gold, if there ever was any, was in such small amounts it was not economical to mine it. The gold rush, like the guano business, pooped out. The post office at Blowout closed in 1918. Every business shut down, and everybody moved away. The town that began with a bang quickly reverted to the quiet countryside it used to be. Galveston Daily News, July 9, 1884, "Postal Matters," p2, c6. Galveston Daily News, March 6, 1897, "Texas Gold Camp Blowout," p2, c6. Burnet Bulletin, August 12, 1879, "Trip to the Frontier," p2, c2.